Thanks to its full-view visibility window, this Bagcraft Papercon 300092 4 1/4" x 2 3/4" x 11 3/4" Dubl View ToGo! 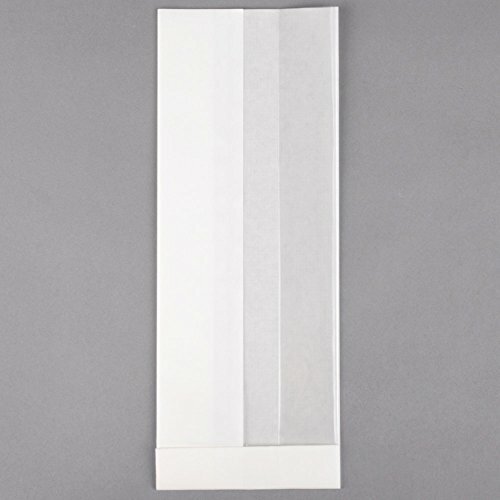 white extra-large window sandwich / bakery bag makes increasing impulse sales a breeze! This bag's crystal-clear, expanded viewing window ensures optimum visibility from the top or the side of the bag. At the same time, the crisp white paper ensures an upscale appearance, great for cold displays at bakeries, cafes, and delis! Plus, this bag can easily be heat-sealed for a safe, secure closure. This bag is perfect for merchandising your signature sandwiches and bakery items. The versatile size makes it great for "to go" stations. Use it for half submarines, cookies, or pastries. It's sure to drive impulse sales anywhere it's used!